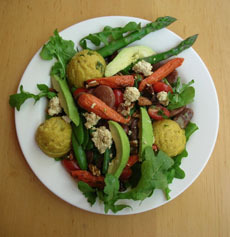 When we first saw this photo (#1) on Angelica Kitchen’s Facebook page, we thought it was a matzoh balls salad. 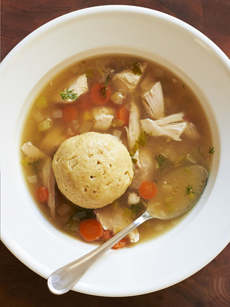 We soon discovered that the matzoh ball look-alikes are actually masa corn dumplings (chochoyotes). In case you’ve never thought about it [and who has? ], matzoh balls are a different style of dumplings than pierogi and Asian dumplings, which are stuffed noodle dough wrappers. Instead, matzoh balls are made without a dough wrapper. They’re a paste of flour* and seasonings—think Chicken & Dumplings. Some other dumplings without noodle wrappers are gnocchi. Knishes are dumplings made with flour wrappers, but a type of pastry dough rather than noodle dough. It’s garnished with tofu ricotta (Angelica Kitchen is vegan—substitute regular ricotta or goat cheese) and ancho pepper cream dressing, sprinkled with toasted pecans. The masa dumplings include bit of spring onions. Here’s a recipe. The dumplings—or matzoh balls—can be served hot or cold. But since we’ll be making matzoh balls this weekend (Chanukah starts on Sunday), we’ll make extras for our own version of this salad, with a different assortment of greens, other vegetables, and dressing. We won’t serve it on the first night—that’s reserved for the chicken soup (photo #2). But we’ll enjoy them on one of the other seven days of Chanukah. We learned this from our friend Claudio, and it’s a blinding revelation of the obvious. Instead of making traditional-size matzoh balls, that need to be cut with a spoon into four or five bites (photo #2), make miniature, bite-size matzoh balls. They’re so much easier to eat, and the petite size is different and, may we say, fun? 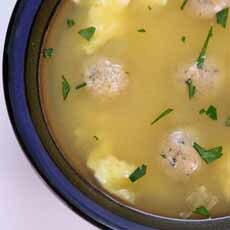 *In the case of matzoh balls, matzoh meal is used instead of wheat flour. Inspiration: This masa corn dumpling salad from Angelica Kitchen. A conventionally-sized matzoh ball. Often, there are two or three in one bowl of soup. Here’s the recipe from Andrew Zimmern | The Food Network. Mini matzoh balls: so much more convenient—and fun. Here’s the recipe from Mario Batali via ABC.go.com.